Bring a large pot of water to a boil and season it with a big pinch of kosher salt. 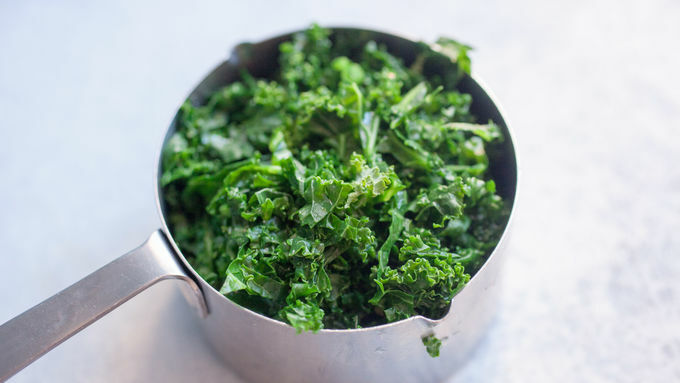 Add 3 or 4 large kale leaves to water and cook for about 30 seconds, until they turn bright green. Use tongs to remove the kale leaves and run them under cold water to halt the cooking process. Discard ribs and cut leaves into small pieces (about 1 cup total). 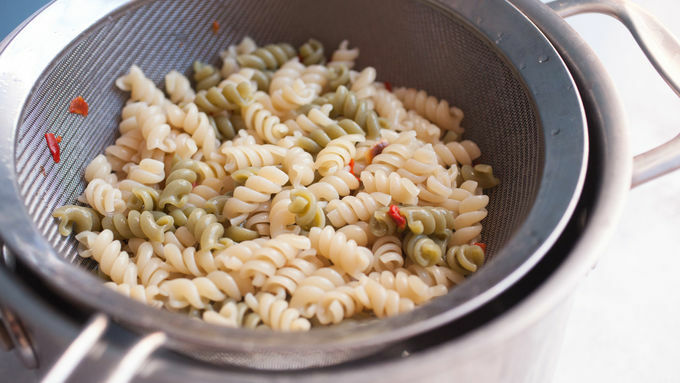 Add the pasta from the Suddenly Salad box to the same pot of boiling water. Cook pasta according to package directions and rinse with cold water when done. 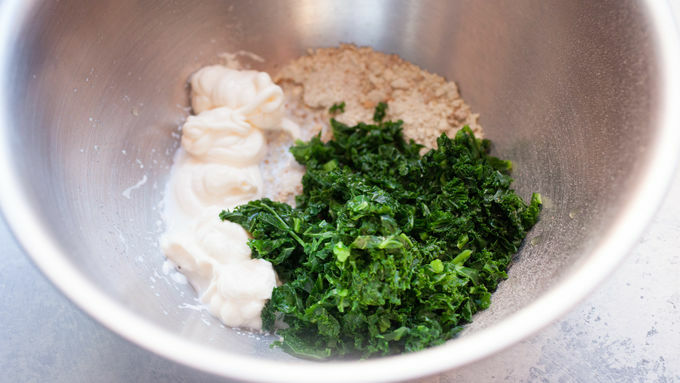 Meanwhile, dress the chopped kale by combining it with mayonnaise, milk and the packet of Suddenly Salad seasoning. Add pasta to kale mixture and stir well to combine. Finally, fold in the Parmesan cheese. Serve immediately or chill and serve later. For a slightly healthier version, leave out the mayonnaise and milk and use 2 tablespoons water and 2 tablespoons olive oil instead. It’s finally here! Picnic season, grilling season, BBQ season…whatever you want to call it, it’s time to feast outdoors. 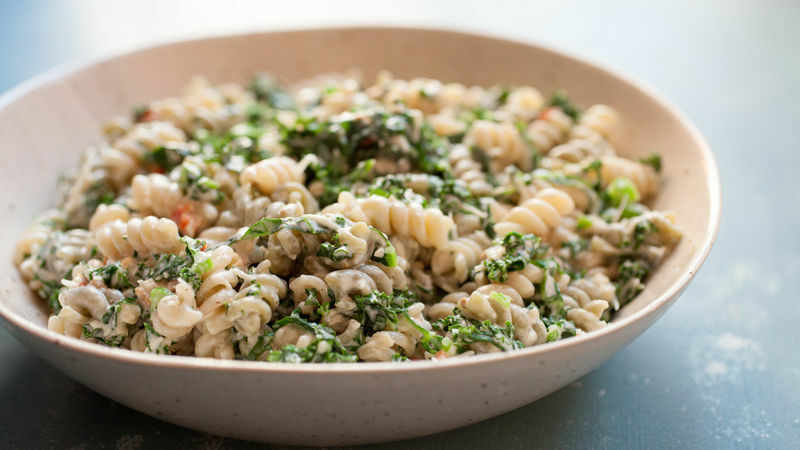 Pasta salad is pretty much the quintessential side dish for all of these parties, and this fast and easy pasta salad is one you can bring to everything. 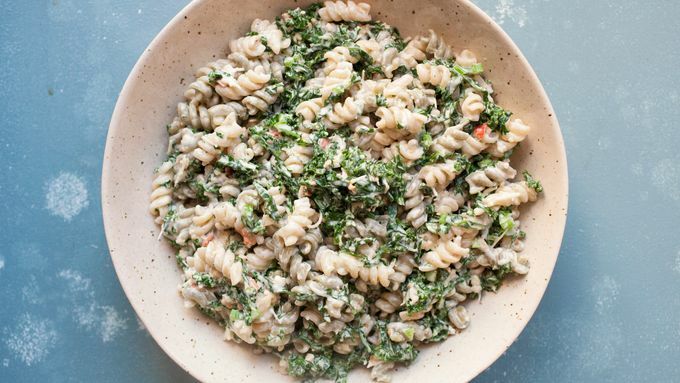 This version starts with Suddenly Pasta Salad™ Caesar and adds in some perfectly blanched kale for a pop of color, crunch and nutrition. You don’t need to use much kale—just a few leaves is plenty. To make the prep even faster, I like to blanch the kale for 30 seconds in the pasta water before I put in the pasta. Then you can pull the kale leaves out with tongs and add the pasta to the same water without waiting for another pot to come to a boil. Just be sure to rinse the kale with cold water to stop the cooking process. Then cut out the large ribs on the kale and dice it up. I like to make my Caesar version creamy by adding some mayonnaise and milk, but you could make a slightly healthier version with olive oil. Both ways are delicious and a great addition to any outdoor party!